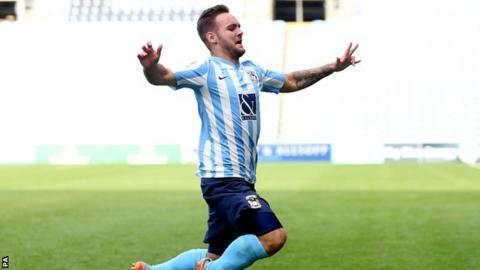 League One top scorer Adam Armstrong's sixth goal of the season helped Coventry City to a hard-fought win at home to 10-man Chesterfield. After a dour first half, Armstrong stroked home Jacob Murphy's through-ball to put the home side ahead. The Sky Blues continued to press and were nearly rewarded but Tommy Lee got down well to save Murphy's low drive. Chesterfield substitute Mani Dieseruvwe was sent off in the closing stages as Coventry claimed the three points. "We probably made it a bit more nervous than we needed to, but it was an exciting performance. We ultimately deserved to win and we got there in the end. "In matches like this you have to be resilient and dig in. The frustration is that we didn't take more of our opportunities. That's something we're going to have to work on. "They're young footballers. Hopefully the supporters will be patient with the team and the ones who came along will see the potential and the shoots of an emerging team." Match ends, Coventry City 1, Chesterfield 0. Second Half ends, Coventry City 1, Chesterfield 0. Attempt blocked. Ryan Kent (Coventry City) right footed shot from outside the box is blocked. Sam Hird (Chesterfield) is shown the yellow card for a bad foul. Corner, Coventry City. Conceded by Sam Hird. Second yellow card to Emmanuel Dieseruvwe (Chesterfield) for a bad foul. Hand ball by Emmanuel Dieseruvwe (Chesterfield). Attempt missed. Oliver Banks (Chesterfield) right footed shot from outside the box is too high. Substitution, Coventry City. Ruben Lameiras replaces Adam Armstrong. Sylvain Ebanks-Blake (Chesterfield) wins a free kick in the attacking half. Attempt saved. Ryan Kent (Coventry City) right footed shot from the centre of the box is saved in the centre of the goal. Attempt missed. Marc-Antoine Fortuné (Coventry City) left footed shot from the right side of the box is close, but misses to the right. Attempt missed. Reda Johnson (Coventry City) header from the centre of the box is close, but misses to the right following a corner. Corner, Coventry City. Conceded by Gboly Ariyibi. Substitution, Coventry City. Marc-Antoine Fortuné replaces Jim O'Brien. Attempt saved. Ryan Kent (Coventry City) left footed shot from a difficult angle on the left is saved in the bottom left corner. Corner, Coventry City. Conceded by Thomas Lee. Attempt saved. Jacob Murphy (Coventry City) right footed shot from the left side of the box is saved in the bottom left corner. Corner, Chesterfield. Conceded by Lee Burge. Corner, Chesterfield. Conceded by Reda Johnson. Attempt blocked. Emmanuel Dieseruvwe (Chesterfield) right footed shot from outside the box is blocked. Attempt saved. Jacob Murphy (Coventry City) right footed shot from the left side of the box is saved in the bottom right corner.